The "Silver Bullet" in the treatment of thrush, white line and hoof rot! When you activate it with equal amounts of white vinegar, it becomes very aggressive in stopping bacteria, fungus and yeast on contact. Safe on skin and hair. Bacterial growths such as rain rot on horse legs are eliminated with one application. Will not dry or irritate raw flesh. Liquid White Lightning® is activated by mixing it with equal parts of white vinegar. This step should be performed in paper or plastic cups, but not in metal as it is an oxidizer. White Lightning® is aggressive 8 hours once mixed with vinegar. After 8 hours it becomes inert. Never mix more than you are going to use at one time. A foot treatment consists of 3 - 4 oz White Lightning®, 3 - 4 oz white vinegar. 1. Remove shoes, if possible, and clean the hoof of dirt and debris. 2. Insert the clean hoof in a heavy plastic bag containing the activated White Lightning® and secure the top of the bag around the leg to prevent the escape of the gas produced by the activated White Lightning® (a rubber band works well). 3. Stand your horse in the bag for at least 40 - 45 minutes. CAUTION: Do not mix any other product with White Lightning®. 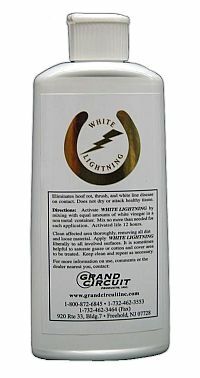 White Lightning® liquid may bleach hair or clothing. Water may be added to a foot soak if desired. Repeat as necessary every 2 - 3 days.